This is a huge game -- almost as big as some role-playing game environments and what's more, it doesn't rely on miles of twisty passages that all look the same. Each location is richly detailed -- the graphics are very impressive and the music is superbly evocative and at times quite eerie as befits the nature of the story. (Though I will admit to missing the rather stirring theme from Return to Zork.) The 360 degree panning enables you to thoroughly explore your surroundings and immerse yourself in the fantastic locations that comprise the world of Zork Nemesis, but be warned you will need a fairly high powered system to get the most out of it and, though not essential, Windows '95 is strongly recommended. The game is played from a first person perspective and at times it reminded me a little of Myst, only smoother and much darker. Your character is unseen and seemingly nameless and genderless (unlike Return To Zork) although there is the possibility (gleaned from a book in the Temple library) that you may be the unfortunate spy Bivotar whose journal comes with the game package. I say 'unfortunate' because, as the book explains, Bivotar has been killed by Nemesis but there is just the possibility of his return. The point is probably debatable, however, my preference is for the nameless protagonist since the game goes to rather elaborate lengths not to identify you or refer to you as male or female, even to the extent of your image not appearing in mirrors. I must say I really appreciated this aspect because throughout the game I could simply be me -- the adventurer and explorer as in the early Zork text adventures. At this point it is probably fair to say that Zork Nemesis should be viewed and played as a stand alone game as it may very well disappoint the Zork purists despite the scattered references to the Great Underground Empire, Lord Dimwit Flathead, Grues and Flood Control Dams. Many of these slightly humorous references I found to be incongruous within the context of the dark and rather more serious vein which this game adopted. Though I did thoroughly appreciate the picture of the "Grue in his natural habitat" (how did they know it was a he?) and to actually blunder into one in a darkened tunnel brought back fond memories. But enough of my musings -- those of you who have never played the original text adventures will be shaking your heads and wondering what on earth I am going on about. Suffice it to say that it is probably better to forget about the earlier Zork adventures and to savour this game for its own merits -- of which it has many. One important aspect of Zork Nemesis that I particularly enjoyed was the plot. It was intriguing and sufficiently complex to pull me into the story as it progressed. I will say little about it or what you must do as unravelling the story as you explore and solve puzzles is an important element in the game and I would hate to spoil your enjoyment. However, you may find Bivotar's journal to be an entertaining and useful read and it will help to refer to it as you progress. Briefly, four characters -- General Kaine, Madame Sophia, Father Malveaux and Doctor Sartorius -- have dabbled in the forbidden arts of alchemy and are now in the power of Nemesis in the Temple of Agrippa. To learn what is going on you must help all of these characters to regain the elements and metals unique to each of them. Along the way you will also learn about Alexandria and Lucien -- but you will have to discover the rest for yourself. The game essentially has three parts to it. The first involves exploring the Temple and working out what it is you must do. The second, and by far the most absorbing section, requires you to travel to the homes of the four main characters to learn more and to find a specific item. These locations, particularly the monastery and conservatory, are bigger than some entire games I have recently played. The last part neatly ties it all together, but it is also the shortest and easiest section to complete. Zork Nemesis is a wonderful game for those who, like me, love exploring and becoming immersed in a story, but I did have some slight initial reservations brought about largely by my having played the original text adventures and my prejudice against 'smart' cursors -- oh why won't they bring back verbs? It is very easy to navigate your way around with the mouse but I do find that the smart cursor limits the way in which you can interact with the game. Still, I must admit that it works well with this type of game and although it tends to make the gameplay easier than it might otherwise be it does make it more accessible to less experienced adventurers. On a similar note, I really missed a conventional inventory -- you can pick up a few items and scroll through them by clicking the right mouse button, but you don't have a useful description. This resulted in me searching everywhere for a particular object which I knew must exist when I was carrying it around with me all the time -- the problem being that it simply didn't look like the item I was searching for. A real inventory with perhaps a text description would overcome this. 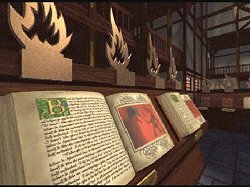 Speaking of text descriptions, people with hearing problems will have difficulty in completing this game as there is no on-screen text apart from the many books and letters scattered about the place. Also, some puzzles involve matching sounds for their solution. However, I must repeat that Zork Nemesis is still a very impressive and most enjoyable game. Though not excruciatingly difficult, the many and varied puzzles are interesting and fun to solve. What's more they fit seamlessly within the context of the game and the story, unlike say The 7th Guest/11th Hour where you must solve unrelated logic puzzles before you can move on. Sometimes the puzzles require the use of inventory items whilst others are of the 'manipulate the mechanism' variety, and many of these are solvable purely by trial and error. However, when you do resort to trial and error rest assured that you are rarely punished for your mistakes. It is possible to die in Zork Nemesis but this doesn't occur too frequently (Grues in darkened tunnels notwithstanding), and restoring, like saving, is a simple matter. The game provides you with twenty save game slots and also allows you to install on-screen hints, but only for the first section. Some puzzles may appear a little obscure at first glance but once you grasp what you are supposed to be doing all will become clear. This is perhaps, most noticeable in the first part of the game where you may stumble upon a puzzle before you have thoroughly explored your surroundings -- the clues are there, you just need to find them. The exception to this for me was in the asylum where, although I found the clues, I couldn't really understand the reasoning behind the rather gruesome (pun intended) actions I was expected to perform. Perhaps I missed something after all. I should note here that in the second part of the game you can travel to the four locations (conservatory, monastery, fortress and asylum) in any order and each is a self-contained world so you don't need to find an item in one to be used in another. I completed the asylum first, but it may have made more sense had I visited this location last. There is also some slight inconsistency in the game as some objects when approached from one direction appear as mere props or scenery yet when approached from a different direction these same objects can be activated and you are rewarded with a vital item or a video sequence to flesh out the story. However, this certainly encourages you to explore each location carefully and to make use of the excellent 360 degree panning. No simple standing in the doorway and waving the cursor around will suffice here. Remember this when you are playing the game or you will most certainly miss something important. Far too many recent adventure games have been shallow and relatively easy to complete in just a few hours, but I'm delighted to report the same cannot be said about this one. Zork Nemesis is a game for savouring and there is no way that you will finish it in an afternoon. As I mentioned above in many ways it is quite reminiscent of Myst, though it does have a limited inventory which adds to the complexity of the game. Still, if you enjoyed Myst you will certainly enjoy this one and I'd recommend taking a look at it anyway. One of our readers has advised that a text patch is now available at the Activision web site for those of you who would like subtitles with this game. Thanks to Catty for this information. Since this review was published it has been pointed out by one of our readers that Father Malveaux in the first part of the game does refer to you as "brother" thus implying that your character is male. Whilst I too noticed this at the time I chose to overlook it as the reference occurs in the sequence where Malveaux is in his sarcophagus and is only aware of the presence of somebody who is trying to help him. Being the head of a cloistered male order he would 'naturally' assume that you too would be male -- a "brother" so to speak. This of course is purely an interpretation on my part and as I couldn't detect any other such references throughout the game I suppose I gave the writers the benefit of the doubt since I assumed that if they did really wish to exclude female players they would have given your character a name in the story and more male identifying references would have been forthcoming. However, since I did go to some length in praising the writers for allowing the game player to simply be themselves I readily conceed that I should have mentioned this one incidence. As our correspondent pointed out, the illusion that she was playing herself was broken at this early stage in the game and from that moment on her character was indeed indelibly stamped as being male. It is a salutary point and one which all game companies should heed if they truly wish their games to be played and enjoyed by as many people as possible. Copyright © Gordon Aplin 1996. All rights reserved.